It is with great excitement we can announce that Lorna Jane South Africa will be retailing BUDDS By DJ Fresh earphones!!! With more than two decades after opening the first Lorna Jane store the core identity remains the same. Lorna Jane is first in fitness and fashion. 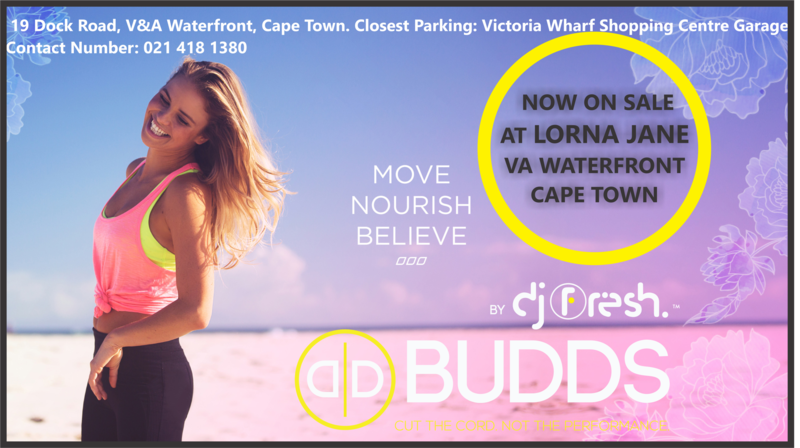 BUDDS is the first (non consumable) outside brand to be listed in Lorna Jane stores in South Africa, and what can we say – we feel proud! So what are you waiting for ladies, pop into Lorna Jane VA Waterfront and one of their skilled and friendly sales assistants will show you how to get your sweat on while being wirelessly connected to your favorite workout playlist!